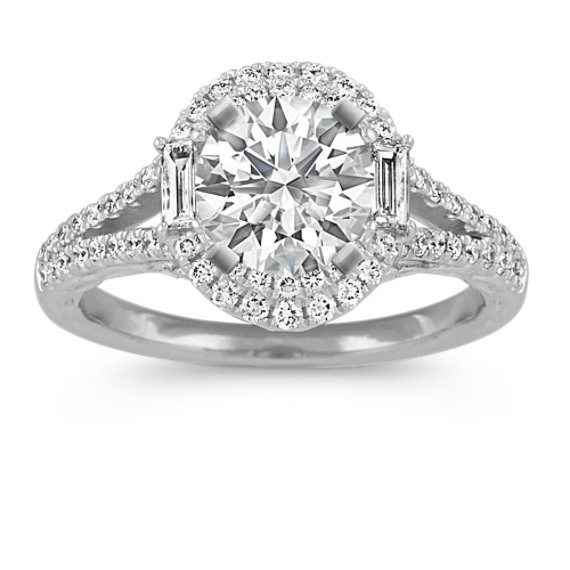 Round Diamond Halo Platinum Engagement Ring | Shane Co. This beautiful engraved engagement ring features 64 round pave-set diamonds (approx. .32 carats TW) and is accented with two baguette diamonds (approx. .13 carats TW). Set in superior quality platinum, this breathtaking split shank engagement ring is just waiting for you to add the center gemstone of your choice at approximately 1.00 carat. The total gem weight is approximately .45 carats. Gemstone Carat Weight :.32 ct. t.w.